Zhong Tian Shopping Plaza (中天购物城 zhōng-tiān-gòu-wù-chéng) – Located at Zhongxin Square near the East Train Station. (Metro 1 Guangzhou Dong Zhan.) (天河北路 233号中信广场). This plaza is more than a place to shop and eat. The plaza has great one-stop service to meet your banking, dry cleaning, grooming and transportation ticket needs. This plaza is more than a place to shop and eat; it has great one-stop service to meet your need of banking, dry cleaning, grooming and transportation ticket. It includes brands such as PORTS、MORGAN、MOISELLE、GIADA、CJ、BMW. There are so many kinds of Classy accouterments, best brands of products (glasses, watch, Leather items…), and expensive cosmetics. They are absolutely fascinating. What’s more, this mall also has beauty salon for you either to make hairdressing or takes care of your nails. 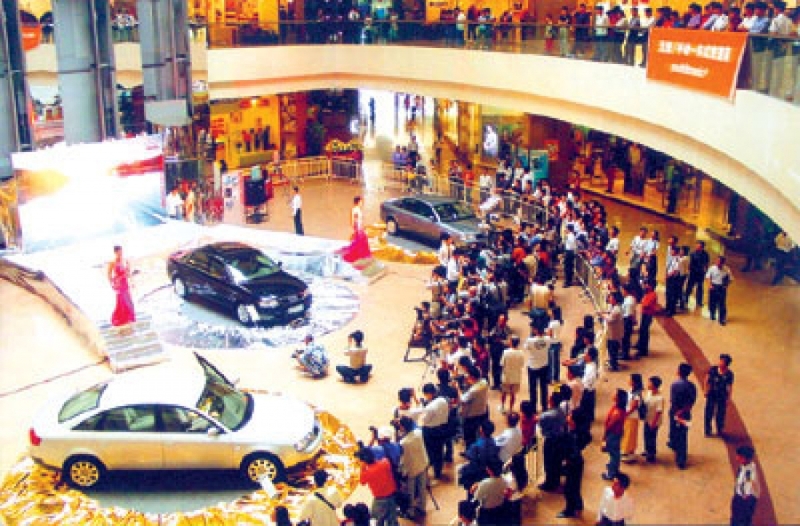 It is one of the popular shopping malls for the white-collars in Guangzhou.